The Fleet Management Solutions include TX-TRAILERPULSE™, TX-DIAGNOSTIX™, TX-FUELCOMPASS™ and TRAXEE™ technologies. The TRAILERPULSE provides real-time track and trace functionality with trailer health and diagnostic information. The DIAGNOSTIX™ technology integrates electronic vehicle data such as motor controls, driver assistance systems, braking systems, steering wheel switches whereas the FUELCOMPASS™ monitors consumption of fuel and provides best-cost-routing and processes vehicle mileage, geo-positioning, engine information, trip details and tachograph readouts. BRUSSELS, Belgium, September 17, 2018 – WABCO Holdings Inc. (NYSE: WBC), the leading global supplier of braking control systems and other advanced technologies that improve the safety, efficiency and connectivity of commercial vehicles, today announced that it will showcase how its newest suite of industry-leading technologies and fleet management solutions are helping to empower commercial fleets at IAA Commercial Vehicles 2018, one of the industry’s largest and most global trade shows, in Hanover, Germany, from September 20 to 27. 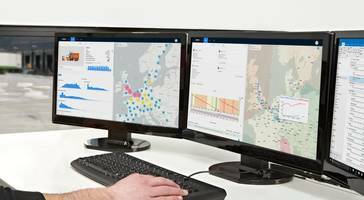 At IAA 2018, WABCO will demonstrate its ability to “mobilize vehicle intelligence” and connect fleet operations through a range of new applications that, among others, include a ‘Big Data’ enabled fuel management system, an advanced Fleet Management Solution (FMS) for trailers and a powerful remote diagnostics solution for all makes of truck. Also on show will be TRAXEE™, WABCO’s recently-launched innovative FMS for small and mid-sized fleets. “At IAA Commercial Vehicles 2018, WABCO will highlight how its innovative and ever-growing portfolio of digital solutions is helping commercial fleets to drive improvements across their value chain,” said Nick Rens, WABCO President, Aftermarket, Digital Customer Services, Trailer and Off Highway Division. “As fleets embed their businesses more deeply into digital transportation ecosystems and leverage over-the-cloud applications, WABCO’s unique blend of industry-leading technology combined with the advanced functionality of our Fleet Management Solutions is helping fleets to access new levels of operating efficiency and safety,” added Rens. “We look forward to sharing our latest innovations at IAA 2018 to particularly demonstrate how WABCO is helping fleets to accelerate their connectivity to the ‘Internet of Things’ as another dimension to sustain their differentiation,” added Rens. WABCO TX-TRAILERPULSE™ – An innovative, cost-efficient trailer-specific telematics solution, TX-TRAILERPULSE combines real-time track and trace functionality with additional trailer health and diagnostic information. Complementing WABCO’s comprehensive trailer FMS, TX-TRAILERPULSE can be easily installed by the manufacturer or as a retrofit. Enabling fleet operators as well as trailer leasing and rental companies to better track, safely maintain and manage their assets, TX-TRAILERPULSE provides a suite of essential remote management functions without incurring the large capital investment of a high-end trailer telematics solution. TX-TRAILERPULSE will be available alongside WABCO’s entry-level TX-GEO™ solution which offers basic track and trace functionality and TX-TRAILERGUARD™, its advanced trailer telematics solution. WABCO TX-DIAGNOSTIX™ – Developed with diagnostics specialist WABCOWÜRTH, WABCO’s TX-DIAGNOSTIX is an advanced FMS enabled remote diagnostics solution that provides fleets with a detailed, over-the-air assessment of the technical health of all brands of trucks. TX-DIAGNOSTIX scans and integrates all electronic vehicle data, such as motor controls, driver assistance systems, braking systems, steering wheel switches, oil pressure systems, power supply systems, tachographs, axles, gearboxes and clutches. Significantly enhancing fleet operational efficiency, the solution consolidates this data into a real-time, single view on screen, helping to reduce vehicle downtime by quickly identifying problems, listing repair recommendations, scheduling maintenance or re-routing vehicles to workshops for safety critical repairs. WABCO TX-FUELCOMPASS™ – An innovative, ‘big-data’ enabled telematics solution which monitors fuel consumption and provides best-cost-routing without the need to install a fuel sensor. Processing telematics data, including vehicle mileage, geo-positioning, engine information, trip details and tachograph readouts, it can be combined with fleet-specific information such as fuel tank size and fuel card usage to calculate total fleet fuel consumption. TX-FUELCOMPASS additionally offers geo-tracking functionality to identify the closest gas stations and local fuel prices to an individual truck. A stand-alone solution, TX-FUELCOMPASS can also be integrated with WABCO’s advanced FMS, TX-SKY™, or with displayless TX-GO™ systems. WABCO TRAXEE™ – Designed to meet the specific needs of operators of small and medium-size commercial fleets, TRAXEE is a cost-efficient FMS which offers several business-critical functions to enhance operational efficiency. Launched as a scalable and rapid pay-back solution, TRAXEE enables operators to better coordinate fleet capacity, manage driver activity and lower administrative overheads. The system also provides real-time status updates on individual trucks and drivers while helping to address tachograph legal compliance requirements throughout Europe and Turkey. WABCO will also showcase its globalizing digital solutions portfolio, particularly highlighting recent expansion of its offerings in emerging markets, notably China and India. WABCO’s joint venture agreement with G7, an award-winning technology leader in China’s fleet logistics industry, is already supplying its first trailer fleet management solutions to significantly improve trailer safety, security and efficiency. WABCO has also advanced its FMS expertise into India with the acquisition of AssetTrackr, an innovative cloud-based FMS provider based in Bangalore. A selection of WABCO Retrofit Solutions, designed to offer fleets access to WABCO technologies after vehicle purchases will also be on display at IAA 2018. Amongst the many retrofit solutions, WABCO will showcase its OptiFlow™ aerodynamic systems, OptiTire™ Tire Pressure Monitoring system and OptiLock™ digital trailer locking solution at IAA 2018. As part of its extensive Aftermarket offering, WABCO has recently expanded its ProVia parts portfolio. ProVia is WABCO’s budget aftermarket parts brand for commercial vehicle braking systems. Launched in 2016, ProVia products are specifically engineered to provide reliable performance and are manufactured to industry-leading standards. Striking a powerful balance across safety, reliability and cost, ProVia has quadrupled the number of products in its portfolio in response to growing customer demand and now offers over 170 budget parts across 24 separate product lines. Another differentiating Aftermarket offering is WABCO’s Reman Solutions. Providing fleets with a cost-efficient and environmentally-friendly service that converts used electronic, hydraulic, mechatronic and conventional mechanical components to fully-warranted, as-new products, WABCO Reman Solutions are globally available. WABCO ACADEMY is a global fleet and technical workshop-oriented training service. Its continuously expanding network now provides trainings in over 45 countries world-wide. WABCO Academy offers product training, driver training and business training based through both classroom and online platforms. To date WABCO Academy has trained over 190,000 workshop, distributor and fleet customers. Public Days: September 20 - 27, 2018, 9 a.m. - 6 p.m.
WABCO’s press conference will be held on September 19 from 1:45 to 2:10 PM CET in the Convention Center, Rooms 13 and 14.